I thought I would read The Story Girl because it had been years since I had done so. It has been. But I apparently read this one during the 2009 L.M. Montgomery Reading Challenge. It hasn't been quite as long as I thought since I read it, but I'd already forgotten quite a bit! On the one hand it kinda bothers me that my memory is so poor. On the other hand, I was able to enjoy the story all over again! As I mentioned back in 2009, The Story Girl is listed as being Montgomery's personal favorite of her books. As I also pointed out, she made the statement that this particular book was her favorite in 1917, which was early on in her career, relatively speaking. I don't know that it can be authoritatively stated that The Story Girl is Montgomery's all-time favorite of all of her works, but the fact that she said it even once makes it worth at least one read during your LMM reading lifetime, in my humble estimation. 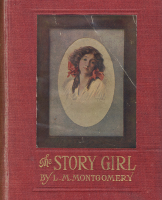 * Montgomery began writing The Story Girl in 1909 but interrupted the writing to revise Una of the Garden (which was renamed Kilmeny of the Orchard.) She completed writing The Story Girl in 1910 and it was published in 1911. This was all during her quiet and long engagement to Ewan Macdonald. * Montgomery said that The Story Girl was her favorite and it is assumed that this is because she put a lot of herself into the character of Sara Stanley who, like her creator, was not all together attractive but captivated people with her ability to tell a wonderful story. * The book is narrated by a male character, one of the boy King cousins, by the name of Beverly. Those are some of the interesting academics, if you will, behind this book. The reason I love it (and other of Montgomery's writings) is not for the academics though. It's for the beauty which she describes so very well and the way that she encourages her readers to imagine along with her as she tells her tales. In this book the King cousins spend a great deal of time in the family orchard. The orchard was planted and grown up over time by their grandfather, Abraham King. When Abraham King married, he brought his bride Elizabeth back to his home and land, and together they planted the first tree in what was to become the King Family orchard. For each child that they had, they planted another tree. People in today's society seem to have a hard time being truthful about their strengths and weaknesses as a general rule. I would even narrow the statement down to say that people in the Body of Christ have a hard time being honest about their strengths and weaknesses. We all want to be seen as competent but we cannot be competent in all areas. While I may be able to do one thing very well, there are other areas where I have almost no skill at all! (Take for example blogging. I can blog and communicate with written words. I cannot sew and I should never try to serve anyone, anywhere at anytime, by saying that I can sew. I do myself a disservice insisting that I can. I cannot.) That's a "light and fluffy" example to express a deeper truth. There are things I know I can do very well and there are things I know I do very poorly. While I'm not excused from doing Hard Things, I can make honest assessments about my abilities, strengths and weaknesses so that I can humbly learn. I thought The Story Girl's statement was an excellent example of truth. Montgomery reminds me that beautiful things still exist. She slows me down from the break-neck pace of life and tells me stories that remind me that childhood magic is dancing all around me, if I'll only slow down and notice. She fills me with passion to defend and protect childhood for my own kids. Reading her books makes me realize how important it is to preserve imagination -- so that we can always find our way back to fairyland where good and evil war against each other and truth always wins. I love Montgomery for this. And so I read on - for my own sake as well as that of my children. This one is unfamiliar to me, but interesting! It will be a good one to explore once I get through all the Anne books. "Humility is not thinking less of yourself, but thinking our yourself less." has echoed these sentiments: Humility is not an exaggeratedly low opinion of yourself. "Humility is self-forgetfulness." I hope you don't mind all the quotes, this has just been something I've been thinking on so you struck a nerve with me. :) It is so easy (at least for me) to insist on self-put downs thinking that will make me humble. But true humility is recognizing our faults and weaknesses indifferently. I also liked the quote about "fairyland", although I wouldn't necessarily call it that (fairies scare me). I have noticed that when I was younger their was a part of my imagination open that I don't know if I can ever access anymore. Whoops! I meant to write "*strengths* and weaknesses." I have to special order thid one through the library...even though they have the next book. Great review, Carrie. We watched the first episode of Avonlea last week! My girls loved it and we're do disappointed when the rest of our borrowed DVDs wouldn't play. I'm struggling right now to get through the book I'm reading so I can move on to A Tangled Web! This is my favourite book (second to Anne of Green Gables). I had difficulty getting hold of a copy in England. And brought mine on Amazon (it was shipped from America). The book takes me back to my own childhood when everything had a rosy tint to it. It's a book I can read and re-read. I haven't read this one. I'll have to see if my library carries it! I've been meaning to ask you... I've seen you post that C.S. Lewis quote a number of times and I'm quite interested in it. Have you written a post about why exactly it's a good idea to reread books? I'm curious as to why Lewis takes this stance. And this is why I didn't read your review until I had written my own. I love how you talk about Montgomery's books. You see so much more in them than I do. That's probably why I keep trying to like them. I guess I'm trying to see what you do.